Typical Texans first, last and always; full of humor, open heartedness and friendly to the core! While Eleanor enjoyed her miniatures, small plates with excellent iridescence, and setting up displays for others' enjoyment, Jack thoroughly enjoyed the “people aspect of carnival glass”. He always had time for conversation and sharing his small portable bottle of Spicy Hot Sauce during lunches and banquet meals. Jack took a turn as President of the Texas Club, and they would travel East for the ACGA Conventions each year. They were always in attendance at HOACGA Conventions during the 80s and into the late 90s, and graciously drove to San Diego in the late 80s to present a fine program for one of our quarterly meetings. Always willing to help in the promotion of carnival glass in whatever capacity they were invited to participate, they are sorely missed by all of us who knew them as a wonderful couple. Prices shown beneath each photo, indicate results of their auction, held in conjunction with the Texas Carnival Glass Convention - March 1, 2008. SCROLL EMBOSSED 8 in. Plate with HOBSTAR and TASSEL Ext. - $2200. SCROLL EMBOSSED/HOBSTAR and TASSEL: This was a treasured item in Eleanor's collection; a “signature piece”, if you will, and one which she always used in her many displays for conventions. It measures 8” and the base mold accommodates the Scroll Embossed interior pattern quite beautifully. If there are any others known, we have not heard of it, nor seen any such likeness in our more than 30 years of tracking carnival glass. Kathi and Galen Johnson gifted us many years ago with a 7 ½” ruffled pressed glass bowl having HOBSTAR and TASSEL exterior. The edge is just as is seen on this plate, which we will call more green than helios. 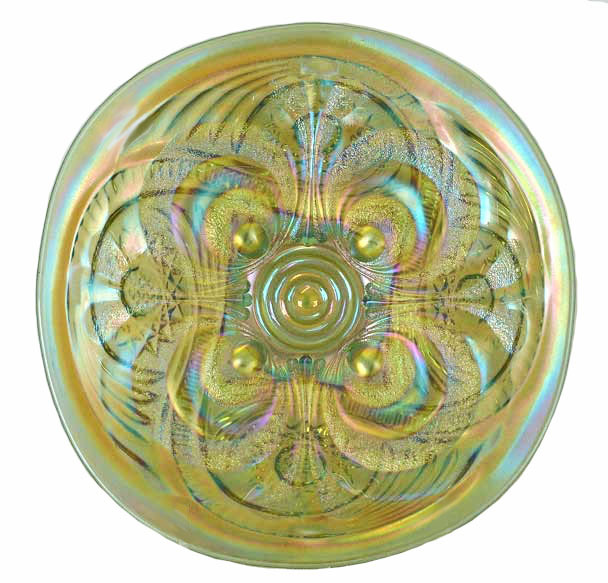 The iridescence on this “believed to be one-of-a-kind” is superb, leading us to believe that just as glassworkers at Fenton Glass are known to have experimented during lunch break and between shifts, so did those who worked at Imperial Glass. Very likely this piece was made for a special gift by one of the workers. Left - As seen in THE COMLETE BOOK OF MCKEE by Sandra Stout. Right - PEEK-A-BOO Toothpick by McKee - sold at auction for $135.00. PEEK-A-BOO-Toothpick: Displayed in a detailed drawing within the Complete Book of McKee by Sandra McPhee Stout. Since McKee Glass is not known to have iridized glass, it becomes apparent that this delightful item was among others known to have been a part of the after-market iridizing process. Whether or not this is the example owned by the Hamiltons, one such as this sold during a Tom Burns auction in 1994 for $190. Miniature COW.-$310. ---------------- Miniature DUCK Ash Tray- $15. COW: If ever there was a smiling cow, this is “it”. This miniature is just 2 3/8” in length. At the time Eleanor was competing for ownership of this piece, the late John Britt was also bidding. They always entered into a bidding frenzy whenever a nice miniature appeared in an auction. 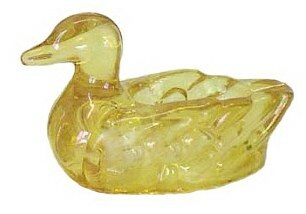 Miniature Duck Ash Tray: Thought to be an individual ash tray. There is a slot that would accommodate a single cigarette where the duck's wing tips meet. Miniature SKATERS SHOE.-$55 ----- SERPENTINE ROSE Creamer.-$25. SKATER”S SHOE: Has been seen only in marigold and classified as a so-called “Victorian novelty”. 4” in length and stands 3” to the tallest portion. According to Book 10-Marion Hartung, the rear portion of the shoe is hollow. The skates and heel and toe are solid glass. Research estimates place this c.1910. The Spring 1982 issue of The Glass Collector carries an article written by the late Don Moore, surrounding some of the U.S. Glass production items. This particular mould is attributed to Duncan/USG. SERPENTINE ROSE: Described in Hartung Book 10, as being 3 ½” to the tallest point of the spout, with a base diameter of 2 1/8”. The only color seen is a rich marigold. There are two mold lines and the underside of the base has a raised single rose blossom. The stippling is very finely done, showing workmanship not usually observed in mass-produced glass. Miniature in stature, we wonder about the possibility of the three remaining pieces to form a complete table set. 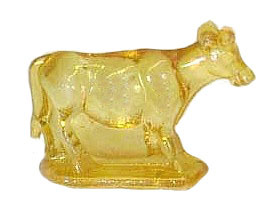 Right - REXFORD Miniature Butter by Higbee Glass. Part of a child's set.- $95. SWEET SIXTEEN or Diamond Top? : Eleanor may have labeled this small breakfast-sized sugar with a “sweet” name, but Marion Hartung called it Diamond Top in her 1973 Book 10. 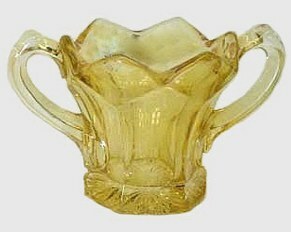 A carry-over from the pressed glass period, the glass is of the thickness found in the Fostoria “American” pattern pressed glass. 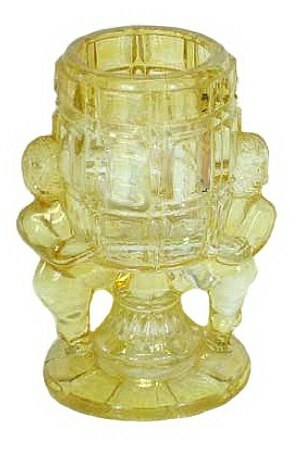 The color of this piece is light amber-marigold. 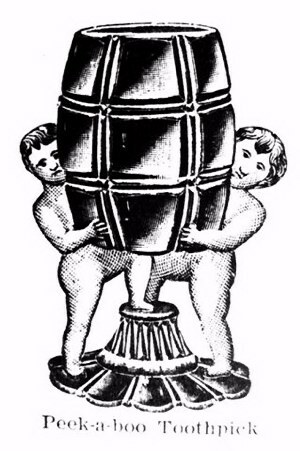 It is 2 ½” high x 3 ¾” across the handles. The base is rayed. “Colonial” type patterns with simple lines and sturdy handles are typical of prevalent patterns from the early 1900s. The “applied” color to this example no doubt arose from “after-market” efforts. 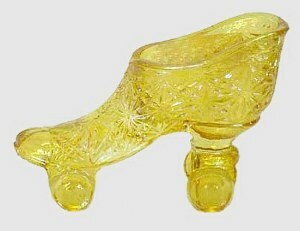 REXFORD Miniature Butter Dish: Attributed to Higbee Glass Co., we might guess this to be part of a four-piece “child's table set”. MANHATTAN Liquor Set - $2700. 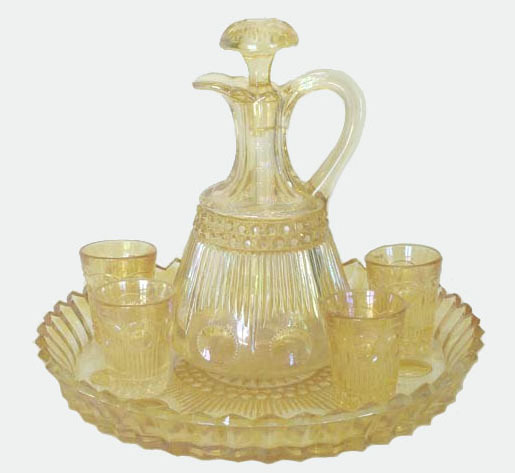 MANHATTAN Liquor Set: This set and the 6 ½” vase are the only shapes seen in carnival glass, both being in marigold. 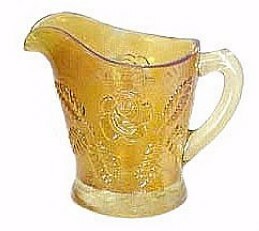 By clicking on ~ ~ in our pattern alphabet, you can view the vase. Mrs. Hartung calls the vase pattern “Souvenir Vase”, pg. 62, Book 10. Since the pattern had apparently not been included in her research prior to 1973, and did not include mention of this liquor set, few, if any others may exist. 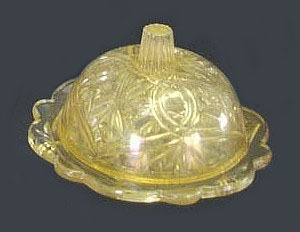 The pattern was produced by U.S. Glass in pressed glass form. The two or three vases, along with this set must be from after-market iridizing. We know of no other liquor sets. One Lord, one faith, one baptism; one God and Father of all, who is above all, and through all and in you all.